” The Federal Government must impose a tax on sugary drinks, mandate Health Star Ratings and ban junk food ads on TV until 9 pm if it wants to drive down Australia’s obesity rates, a Senate committee has concluded. 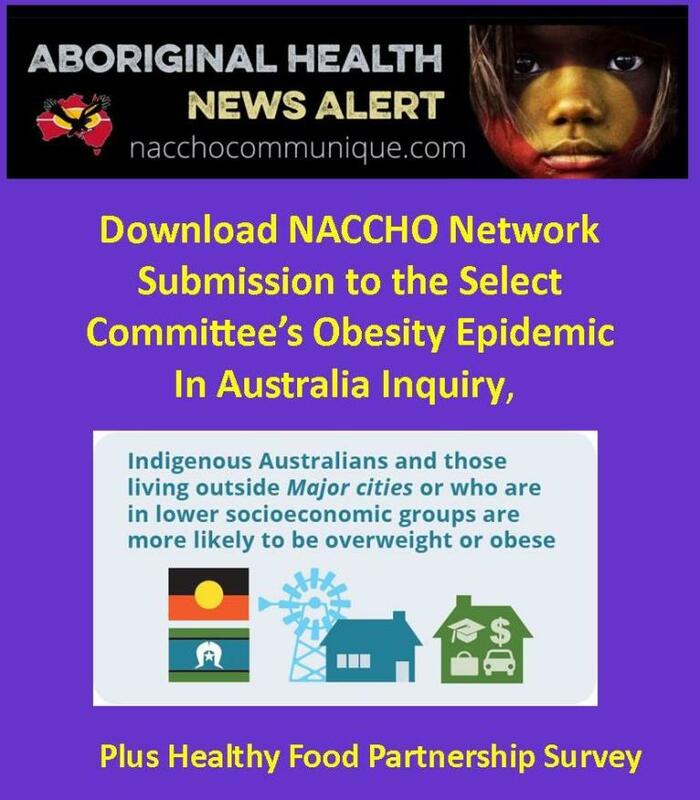 The committee heard that Aboriginal Community Controlled Health Organisations (ACCHOs) run effective programs aimed at preventing and addressing the high prevalence of obesity in Aboriginal and Torres Strait Islander communities. Ms Pat Turner, Chief Executive Officer of National Aboriginal Community Controlled Health Organisation (NACCHO), gave the example of the Deadly Choices program, which is about organised sports and activities for young people. She explained that to participate in the program, prospective participants need to have a health check covered by Medicare, which is an opportunity to assess their current state of health and map out a treatment plan if necessary. However, NACCHO is of the view that ACCHOs need to be better resourced to promote healthy nutrition and physical activity. Ms Turner also pointed out that ‘the supply of fresh foods to remote communities and regional communities is a constant problem’. 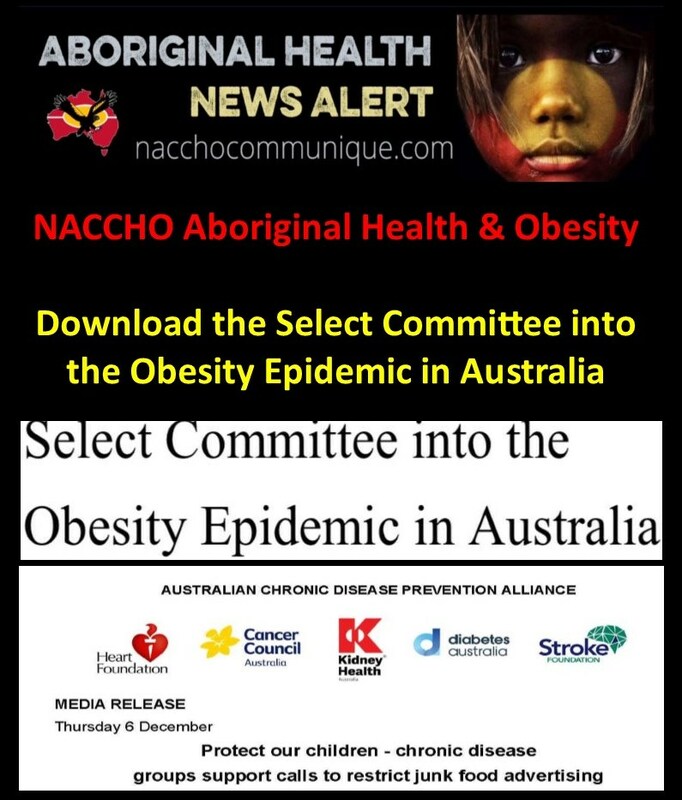 The committee recommends the proposed National Obesity Taskforce is funded to develop and oversee culturally appropriate prevention and intervention programs for Aboriginal and Torres Strait Islander communities. The committee recommends the Commonwealth develop additional initiatives and incentives aimed at increasing access, affordability and consumption of fresh foods in remote Aboriginal and Torres Strait Islander communities. About 63 per cent of Australian adults are overweight or obese. “The World Health Organisation has recommended governments tax sugary drinks and, at present, over 30 jurisdictions across the world have introduced a SSB tax as part of their effort and commitment toward preventing and controlling the rise of obesity,” the report said. “The impacts of sugary drinks are borne most by those on low income and they will also reap the most benefits from measures that change the behaviour of manufacturers,” it said. “Australia does not have an overarching strategy to combat obesity,” it said. The voluntary front-of-pack labelling system has come under fire for producing questionable, confusing ratings – such as four stars for Kellogg’s Nutri-Grain – and becoming a “marketing tool”. “Making it mandatory will drive food companies to reformulate more of their products in order to achieve higher HSR ratings,” the report said. Pointing to a conflict-of-interest, it has recommended the HSR’s Technical Advisory Group expel members representing the industry. “Representatives of the food and beverage industry sectors may be consulted for technical advice but [should] no longer sit on the HSR Calculator Technical Advisory Group,” it said. The group said existing voluntary codes were inadequate and also suggested that all junk food ads in all forms of media should display the product’s HSR. The Liberals wrote dissenting statements, saying a taskforce was unnecessary, HSR should remain voluntary, there shouldn’t be a sugar tax, and current advertising regulations were enough. “No witnesses who appeared before the inquiry could point to any jurisdiction in the world where the introduction of a sugar tax led to a fall in obesity rates,” they said. Labor senators also said there was no need for a sugar tax because there isn’t enough evidence. “Labor senators are particularly concerned that an Australian SSB would likely be regressive, meaning that it would impact lower-income households disproportionately,” they said. The committee recommends that Commonwealth funding for overweight and obesity prevention efforts and treatment programs should be contingent on the appropriate use of language to avoid stigma and blame in all aspects of public health campaigns, program design and delivery. The committee recommends that the Commonwealth Department of Health work with organisations responsible for training medical and allied health professionals to incorporate modules specifically aimed at increasing the understanding and awareness of stigma and blame in medical, psychological and public health interventions of overweight and obesity. The committee recommends that the newly established National Obesity Taskforce develop a National Obesity Strategy, in consultation with all key stakeholders across government, the NGO and private sectors. The committee recommends that the Australian Dietary Guidelines are updated every five years. Representatives of the food and beverage industry sectors may be consulted for technical advice but no longer sit on the HSR Calculator Technical Advisory Group. The Health Star Rating system be made mandatory by 2020. The committee recommends Food Standards Australia New Zealand undertake a review of voluntary front-of-pack labelling schemes to ensure they are fit-forpurpose and adequately represent the nutritional value of foods and beverages. The committee recommends the Minister for Rural Health promote to the Australia and New Zealand Ministerial Forum on Food Regulation the adoption of mandatory labelling of added sugar on packaged foods and drinks. The committee recommends that the Council of Australian Governments (COAG) Health Council work with the Department of Health to develop a nutritional information label for fast food menus with the goal of achieving national consistency and making it mandatory in all jurisdictions. The committee recommends the Australian Government introduce a tax on sugar-sweetened beverages, with the objectives of reducing consumption, improving public health and accelerating the reformulation of products. The committee recommends that, as part of the 2019 annual review of the Commercial Television Industry Code of Practice, Free TV Australia introduce restrictions on discretionary food and drink advertising on free-to-air television until 9.00pm. The committee recommends that the Australian Government consider introducing legislation to restrict discretionary food and drink advertising on free-toair television until 9.00pm if these restrictions are not voluntary introduced by Free TV Australia by 2020. The committee recommends the Australian Government make mandatory the display of the Health Star Rating for food and beverage products advertised on all forms of media. The committee recommends the proposed National Obesity Taskforce is funded to develop and oversee the implementation of a range of National Education Campaigns with different sectors of the Australian community. Educational campaigns will be context dependent and aimed at supporting individuals, families and communities to build on cultural practices and improve nutrition literacy and behaviours around diet, physical activity and well-being. The committee recommends that the National Obesity Taskforce, when established, form a sub-committee directly responsible for the development and management of a National Childhood Obesity Strategy. The committee recommends the Medical Services Advisory Committee (MSAC) consider adding obesity to the list of medical conditions eligible for the Chronic Disease Management scheme. The committee recommends the Australian Medical Association, the Royal Australian College of General Practitioners and other college of professional bodies educate their members about the benefits of bariatric surgical interventions for some patients. The committee recommends the proposed National Obesity Taskforce commission evaluations informed by multiple methods of past and current multistrategy prevention programs with the view of designing future programs. The committee recommends the proposed National Obesity Taskforce is funded to develop and oversee the implementation of multi-strategy, community based prevention programs in partnership with communities. The committee recommends the proposed National Obesity Taskforce develop a National Physical Activity Strategy. Junk food advertising to children urgently needs to be better regulated. That’s a recommendation from the Senate report on obesity, released last night, and a message that the Australian Chronic Disease Prevention Alliance strongly supports. Chair of the Australian Chronic Disease Prevention Alliance Sharon McGowan said limiting unhealthy food marketing would reduce children’s exposure to unhealthy food and its subsequent consumption. “Unhealthy weight is a major risk factor for cancer, diabetes, heart disease, stroke and kidney disease. Preventing obesity in children is particularly important, as it is difficult to reverse weight gain once established,” Ms McGowan said. Ms McGowan said one in four children are already overweight or obese, and more likely to grow into adults who are overweight or obese with greater risk of chronic disease. “While there are multiple factors influencing unhealthy weight gain, this is not an excuse for inaction,” she said. “Food companies are spending big money targeting our kids, unhealthy food advertising fills our television screens, our smartphones and digital media channels. “Currently, self-regulation by industry is limited and there are almost no restrictions for advertising unhealthy foods online – this has to stop. 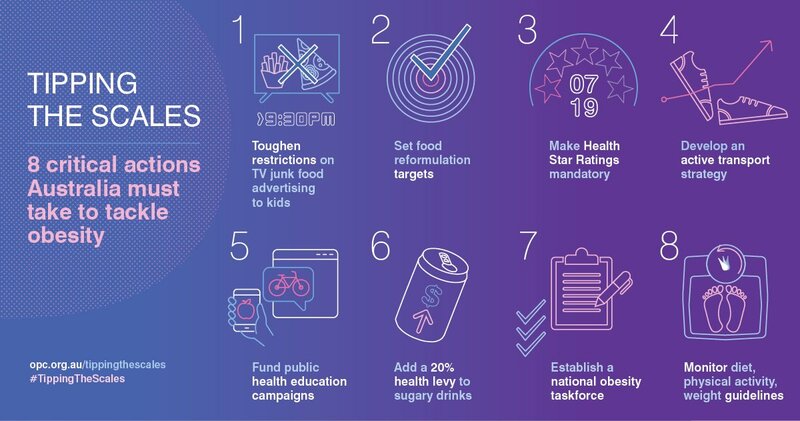 The Australian Chronic Disease Prevention Alliance also welcomed the Report’s recommendations for the establishment of a National Obesity Taskforce, improvements to the Health Star Rating food labelling system, development a National Physical Activity Strategy and introduction of a sugary drinks levy. “We support the recent Government commitment to develop a national approach to obesity and urge the government to incorporate the recommendations from the Senate report for a well-rounded approach to tackle obesity in Australia,” Ms McGowan said. On 10 May 2018, the Senate voted to establish an inquiry to examine the impacts of Australia’s obesity epidemic. The Select Committee into the obesity epidemic was established on 16 May 2018 to look at the causes of rising levels of obese and overweight people in Australia and how the issue affects children. It also considered the economic burden of the health concern and the effectiveness of existing programs to improve diets and tackle childhood obesity. The inquiry has received 145 submissions and has published its full report today. The Committee held public hearings from public health, industry and community groups. The OPC provided a submission and Jane Martin gave evidence at one of these sessions.